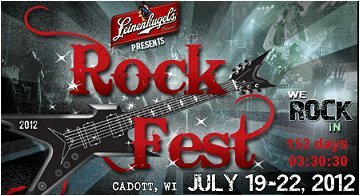 Def Leppard and Poison will play the Rock Fest in Cadott, WI as part of their summer US tour to be announced in full soon. The festival takes place from 19-22nd July with Def Leppard and Poison closing the final day according to the festival organisers. Fellow British rockers Iron Maiden headline the night before Lep. This is the first announced show of 2012 and the first time Lep have played this event since July 2003 on the X tour. They were due to play here in 2011 with Heart but the event was later cancelled after Joe Elliott Snr passed away. That was also the first announced show of 2011. "Iron Maiden will be the headliner on Saturday, July 21, while Def Leppard will top the bill Sunday, July 22, during the annual rock musical festival, which will be held July 19-22 near Cadott." Visit the 2012 Tour News section for more info on this upcoming tour.